Sit down or find a wall to steady yourself, because we just received a donation of koa wood as part of our Manufacturing Waste Diversion program. If you’re a woodworking nerd, you know why that’s such a big deal. If you’ve never heard of koa, let us take you on a little trip to the islands to explain. In the early days of its harvest, only Hawaiian royalty was allowed access to koa wood. Warriors used it to create bows and build canoes. The ali’i, or royalty class, would use koa to decorate their homes. Although the wood is now more widely available, getting a piece of your own is still a challenge. Koa has become the truffle of lumber. Koa trees grow on the Hawaiian Islands at elevations of 2,000-7,000 feet. Needless to say, that makes koa trees pretty rare. To avoid excessive harvesting, the Hawaiian government has made strict rules about who can harvest the wood and how much can be sold in a year. There are laws banning the harvest of living trees, so all koa on the market is from a fallen or dead tree. Another threat to koa’s availability is land space. Much of the land where koa once thrived was cleared to make way for cattle farms and other agriculture. The young sprouts that crop up when a dead tree is moved are particularly appetizing to the cattle and pigs that now occupy the land. Even if you’re lucky enough to get a koa tree, only a small part can be used for lumber. After being harvested, the wood is dried for a number of weeks. As it dries, the wood splits and cracks, taking its final shape. From there, craftsmen can determine how to best use the koa wood based on its new form. Each curl and twist in a piece of koa tells a unique story of where the tree came from and how it grew. The Honokaa variety has a deep red color while the Honaunau has a lighter orange color. The twists in the wood come from the way the trees wrap around each other as they grow. The more figured the pattern, the more valuable the wood. 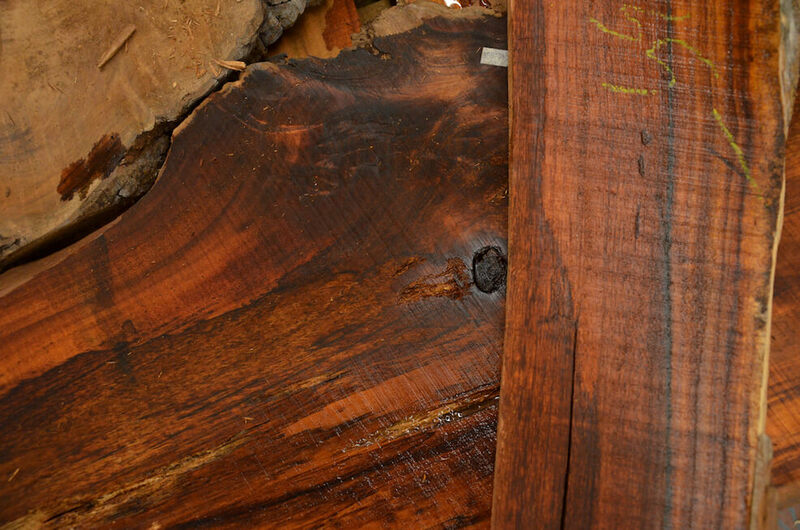 We’re excited to see what our customers will do with their own pieces of koa. We’ve priced the koa between $15-30 per board foot, which means it won’t be sticking around for long. Online retailers often sell koa for up to $100 per board foot. Every cut, sand, and stain can highlight a new feature of the wood. Whatever you make will come with a story of how the rarest tree in the world ended up in Bellingham. Remember, measure twice and cut once. Well – maybe with this piece, measure three times.